Time plays a crucial role in everyone's life. You should always utilize your time accordingly. But after launch of High-End smartphones, tablets, PC, etc. many people are not following their time schedules or can't focus on them. Looking at this matter many developers launched applications which help you create daily schedule and work accordingly. With help of these applications you can get live notifications, set alarms, etc. Today we filter all the best applications which can help you to create a daily plan. TimeTune Schedule Planner is a application developed by TimeTune Studio. TimeTune let's you create your daily time table with a great interface. Just after opening the app you are welcomed by some basic tutorials. Further you will see routines tab with a 'Plus' sign at the top. Just click on that and start creating your schedule. In schedule creating menu you will be able to set - Name, Notifications, Popup messages and options to activate all these. Before writing this review I downloaded this application and used it for many days. After a long term use, I can say that TimeTune Schedule Planner is perfect application for everyone including students or daily workers. Any.do app is placed just after TimeTune application. 'Any.do To-do List' is a application developed by Any.do. This app is best if you are looking to check or edit your schedule in alternate devices as well. Any.do app comes with sync option among mobile, desktop and tablet. It comes with sharing feature as well. With the help of this you can share your to-do list with anyone having this app. It let's you share you data over all major connectivity services - Bluetooth, Wi-Fi, etc. Apart from all these complicated features you get a simple and clean user-interface as well which allows everyone to use it without any issue or confusion. Looking at people's need developers also added ability to add sub-tasks whereas to further simplify your busy day it also comes with Grocery list, daily chores and a personal list named as 'Honey-Do' which let's you add tasks related to your family. If you are planning to manage other things apart from your daily schedule than 'Any.do To-do List' is must for you. 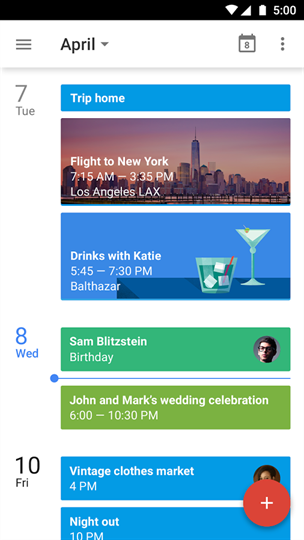 Google Calendar is another brilliant app which let's you organize your daily as well as monthly schedule. This app comes with Google's latest material design. With help of Google Calendar you can set daily plans and monthly or yearly plans. It comes with integration of Calendar and To-do list which makes it a perfect combo pack. Google Calendar comes with a schedule view which give you better view of your task such as Location, Time, Tag, etc. at the same place. Google's Calendar app syncs with Gmail account. With the help of this feature you can easily access all you Google Calendar data anywhere on any device. These are the best schedule planning application available for Android devices. You should give them a try and check it out. Please post your opinions about these applications. Feel free to ask your queries, all of them will be solved as soon as possible. Your guide to the best schedule planners will help many people to increase their productivity in their work and also in their private life. I have one suggestion: please add the web URLs so that it will be easy to install the planners. @A.S. Bhasker Raj - All these applications are available in Google Play Store and can be easily installed on a device with internet connections. As per the developers there are no minimum requirements to use this applications on your smartphones. If you are unable to find any of these application then feel free to contact me. Any.to do is one of the best in this regard. I would have loved to see a few more apps included. There are some better ones on Play Store like Remember the milk and Trello. However, good collection indeed! @timmappa first of all Thank You for thinking my article valuable for your comment. Secondly, based on downloads by people as per Play Store statistics, I reviewed the apps. But as you told about few more applications, so I will re-edit this article with few more applications based on schedule planning.